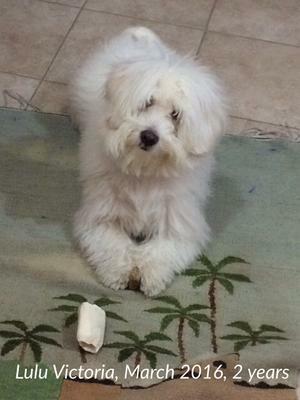 Lulu Victoria, Coton de Tulear? March this year my Lulu Victoria will be 3 years old. I received her as a present, a way of healing me after my 13 years old Schnauzer Miniature passed away. I was told she was a Bichon Bolognese. She was two month old. After another month, the Veterinarian and I realized she wasn’t Bichon bolognese: straight cotton- like hair, elongated body, pink skin, curled tail over her back, white with a tan mark on the right side under the ear. Her left eye lid wasn’t dark but pink, and the paws had patches of pink with very dark brown. Her vaccination passport says: Breed: Bichon Mix. She is spayed and wears microchip. After she was one year I sent samples for a DNA test: it said she has mixed ancestors and the final parents were Gordon Setter mix with Miniature Poodle mix. I complained and the Lab said Lulu was a super mutt. My Lulu is identical to their siblings and to her mother. After reading opinions and viewing all the pictures and descriptions on the web, and especially on this site, I sincerely believe she is a Coton de Tulear!. Actually she has 15 pounds and a height of nearly 12 inches. The pink eye lid is starting to have dark color. She sheds a little and change hair nearly every 6 months. She was born in Kuwait and now we live in Florida. The worst habit? Jumping to dinner table to eat what she finds there. My grandchildren adore her. When I walk her people always ask: What type of breed is that? . 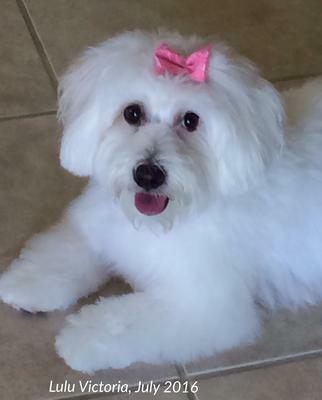 In Florida the new veterinary labeled her as Maltese. Again, I believe she is a Coton. Anyway, she is so lovely and cute that all my family adores her. I am uploading her pictures since she was 2 months old. 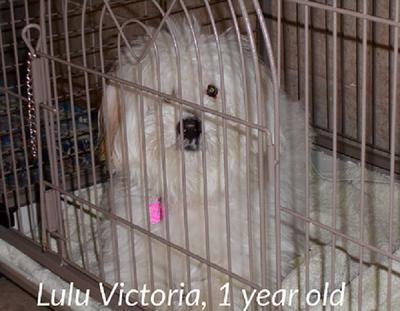 Comments for Lulu Victoria, Coton de Tulear? Yes the matts and grooming is a job. Most people like to keep the "puppy cut " because it's more manageable. You also SUNTANhave a very loving mom. Thanks for your nice comments. I don't know what happened with the Lab and her DNA test. Probably they mislabel the samples. I say she is shedding every 5-6 months because it takes that time to the hair to growth longer than the grooming cut, and I see with longer hair more abundant mats; I interpret this as shedding process. I clean her after every walk. Every 2-3 days I use metal comb; she hates the brushes. If I miss the combing, then the small buds appear. Yes, she sleeps in that funny position, please view the photo. She barks when someone is knocking the door or an extraneous is outside. She loves to announce that the kids are coming from school or that my daughter in law arrived at home. She uses a howling way and short runs to to this. Of course greetings are on two legs. She walks with me and sometimes near my feet that I feel I could hit her. Loves to run in the backyard, mainly large circles. No way to using a laptop on the lap, that is her place! Today we saw her friend Havanensis and for the first time I noticed he is a little taller than Lulu . She looks like one, but you say she replaces her hair every six months? Tuffy is now 9 years old and averages about ten or eleven pounds.tuffy is of the short legged breed of Coton de Tulear is as his name describes just like cotton,and his hair mats like the tip of a cotton Q-tip. His nature is fun loving and independent and very protective of me. She does look like a coton to me as well but regardless she is adorable and what really counts is you love her and she is a lucky little girl. Enjoy your years with her. Cotons do have some traits that might help in deciding if she is. Most like to lay on their backs with front legs folded over at knees, and head bent to one side almost making a C.
they will dance around on their back legs alot----sound familiar? She looks like a Coton to me. Adorable. How could the dna come back so far off???? ?